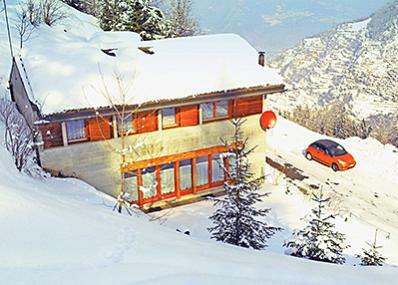 Nice family chalet with stove, situated on the outskirts of La Tzoumaz with a fantastic view over the Valais mountains. On the ground floor there are the cosy living room with sitting area near the stove, the dining area with a huge table and the open plan kitchen. On the upper floor there are four bedrooms and one bathroom with WC. From the two single bed rooms you can reach a mezzanine which is equipped with a sofa. The mezzanine is well suited for older children to play there (steep stairs, at own risk, max. height ~1,50 m). Approx. 400 m distance to the free ski bus and approx. 1,5 km to the village centre with a supermarket, restaurants, bars, child care facilities and bank. Distance to the ski slope and the cable car, ski school, outdoor ice skating rink and indoor pool ~1,8 km.